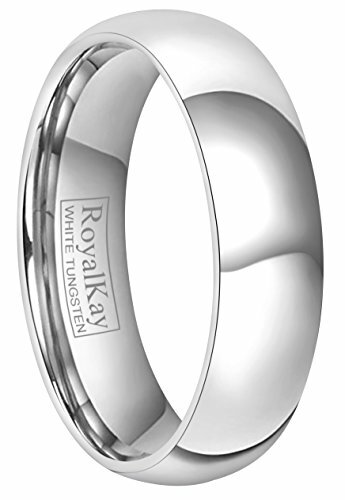 This beautiful White Tungsten rings are in 2mm/4mm/6mm wide options. The Color Of Our White Tungsten Rings are close to Platinum/white gold.It's much whiter than regular tungsten ring.It is all high polished finish and it has a classic plain dome profile,It is ideal for wedding bands,engagement rings or couple rings . If you are looking for a ring that is scratch proof and forever keep its shine, then our Tungsten Carbide rings are for you. Tungsten Carbide is ranked second hardest next to diamond on the Mohs scale, diamond being a 10 followed by Tungsten Carbide as 9. All of our Tungsten rings are Cobalt Free and hypoallergenic. Our rings will not cause skin irritations or turn your fingers green. Width Options:2mm 4mm 40mm.Same White Color As Platinum;High Polished Finish Classic Plain Dome Shape. Comfort Fit.High Quality Guarantee.Free Velvet Pouch Gift Packing.